Ptolemy IV Philopator[note 1] (Greek: Πτολεμαῖος Φιλοπάτωρ, Ptolemaĩos Philopátōr "Ptolemy, lover of his Father"; 245/4–204 BC), son of Ptolemy III and Berenice II, was the fourth Pharaoh of Ptolemaic Egypt from 221 to 204 BC. The decline of the Ptolemaic dynasty began under the reign of Ptolemy IV. Among the children of Ptolemy IV Philopator and his sister-wife Arsinoe III of Egypt was Ptolemy V Epiphanes, who married Cleopatra I Syra, daughter of Antiochus III the Great and Laodice III. Ptolemy IV's reign was inaugurated by the murder of his mother, and he was always under the dominion of favourites, male and female, who indulged his vices and conducted the government as they pleased. Self-interest led his ministers to make serious preparations to meet the attacks of Antiochus III the Great on Coele-Syria including Judea, and Ptolemy himself was present at the great Egyptian victory of Raphia (217 BC) which secured the northern borders of the kingdom for the remainder of his reign. The arming of Egyptians in this campaign had a disturbing effect upon the native population of Egypt, leading to the secession of Upper Egypt under pharaohs Harmachis (also known as Hugronaphor) and Ankmachis (also known as Chaonnophris), thus creating a kingdom that occupied much of the country and lasted nearly twenty years. Philopator was devoted to orgiastic forms of religion and literary dilettantism. He built a temple to Homer and composed a tragedy, to which his favourite Agathocles added a commentary. He married his sister Arsinoë III (about 220 BC), but continued to be ruled by his mistress Agathoclea, sister of Agathocles. In late c. 210 BC, Agathoclea may have given birth to a son from her affair with Ptolemy IV, who may have died shortly after his birth. Strabo, however, mentions that Ptolemy V was the son of Agathoclea but he may have been confused considering that she was his mistress. Ptolemy is said to have built a giant ship known as the tessarakonteres ("forty"), a huge galley and possibly the largest human-powered vessel ever built. This showpiece galley was described by Callixenus of Rhodes, writing in the 3rd century BC, and quoted by Athenaeus in the 2nd century AD. Plutarch also mentions that Ptolemy Philopator owned this immense vessel in his Life of Demetrios. The current theory is that Ptolemy's ship was an oversized catamaran galley, measuring 128 m (420 ft.). 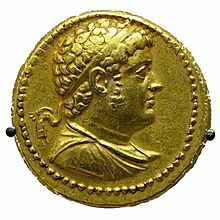 Ptolemy IV is a major antagonist of the deuterocanonical 3 Maccabees, which describes events following the Battle of Raphia, in both Jerusalem and Alexandria. Ptolemy IV's reign was also marked by trade with other contemporaneous polities. In the 1930s, excavations by Mattingly at a fortress close to Port Dunford (the likely Nikon of antiquity) in present-day southern Somalia yielded a number of Ptolemaic coins. Among these pieces were 17 copper mints from the reigns of Ptolemy III, Ptolemy IV and Ptolemy V, as well as late Imperial Rome and Mamluk Sultanate coins. ^ Clayton (2006) p. 208. ^ "Ptolemy IV Philopator". Livius.org. ^ Polybius, XV 25.2. Cf. Zenobius, V 94. ^ Bevan, Edwyn (1927). The House of Ptolemy: a History of Egypt under the Ptolemaic Dynasty. London: Methuen. p. 233. This article incorporates text from a publication now in the public domain: Chisholm, Hugh, ed. (1911). "Ptolemies". Encyclopædia Britannica. 22 (11th ed.). Cambridge University Press. p. 617.